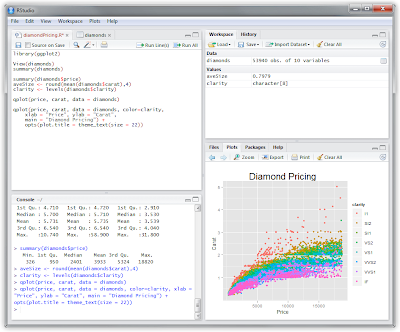 Just saw the announcement of the availability of Rstudio, a new (free & open source) integrated development environment for R that works on Windows, Mac, and Linux. Judging from the screenshots, it looks like Rstudio supports syntax highlighting for Sweave & easy PDF creation from Sweave code, which is something I haven't seen anywhere else (on Windows at least). It also has all the features you'd expect of any IDE: code syntax highlighting, code completion, an object and history browser, and a tabbed interface for editing R scripts. I've been happily using NppToR for some time now, and although it works well for me, it's no real IDE solution. I'll have to give this one a shot. I installed RStudio on my Macbook Air with no problem. I have like the Mac environment much better than Windows. (I use mac at home and windows at work.) It will be nice to have RStudio as an alternative. I have not been using Sweave because I am not already a TeX user, and I haven't tackled the learning curve. I hope RStudio may make this eaiser. 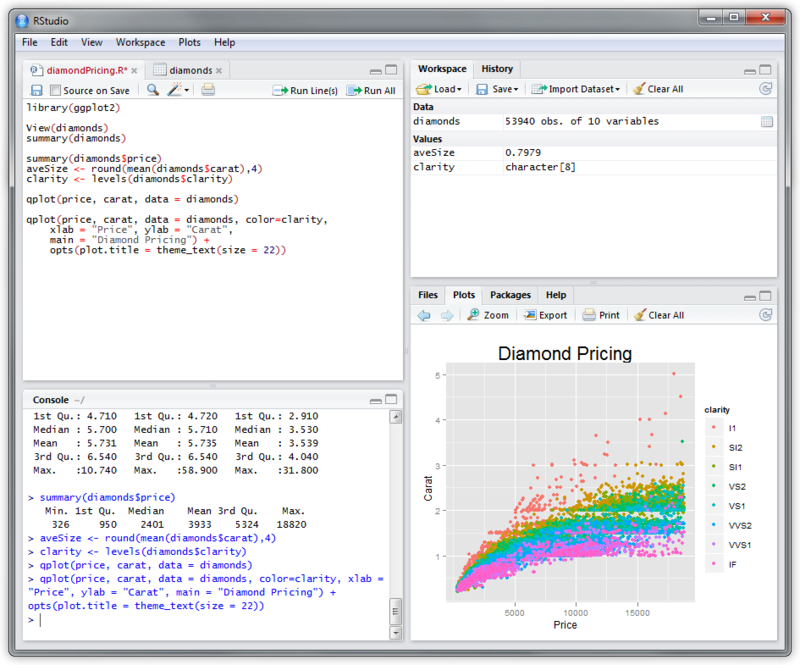 RStudio looks very nice indeed!!! Finally someone had the ability to integrate the plot window in a unified IDE. Even Revolutions dont do that - and that costs money!! I havent taken it for a drive yet, just run some simple code snippets - but from what i've seen I'll jump ship! This is what I imagined my R IDE being from the start. I was getting disillusioned after trying everything from RGui, Tinn-R, Eclipse-StatET, Revolutions R Enterprise and ended up with Notepad++/NppToR - as mentioned - NOT an ideal solution. I installed RStudio last week on my Macbook and found that it runs 5 - 10 times slower than native R. Very disappointed by the performance, but loved the GUI. I'm hoping that with time, the performance will improve. I have also noticed a huge slowdown between the R command line and RStudio. At this point it seems great for small projects, but for anything computation-intensive I'll stick with Notepad++ and NppToR. I also get more frequent out of memory errors with R studio. I tried the updated version again a few days ago and found the same slowdown in performance - it crashed my system after using for 30mins!!!! Yes, the IDE is "pretty", and yes there have been some promising improvements in customising it, but the performance is still poor. I am surprised the developers haven't put a beta tag on it. i too installed RStudio and I was really impressed by their implementation of Tex and Sweave files.